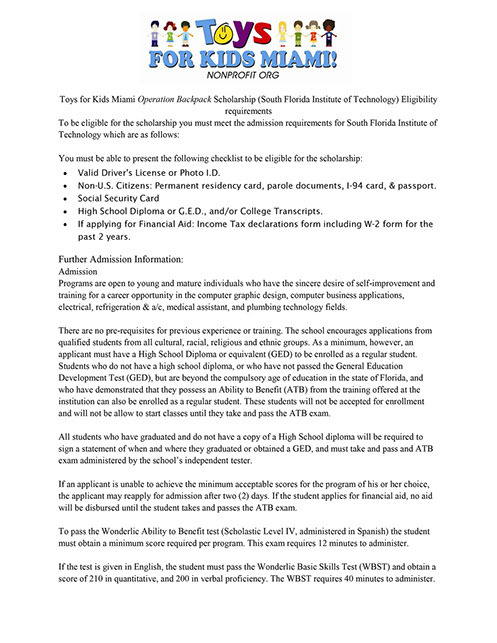 Standing as a leader for promoting higher education in South Florida, Florida National University (FNU) has partnered with Toys for Kids Miami Foundation (TKM) to expand opportunities for post-secondary education to 12th grade students enrolled in public high schools in Doral. Honoring the mission statements of both organizations, the TKM scholarship aims to Prospective applicants are required to comply with Florida National University’s standards for scholarship application in order to be considered. 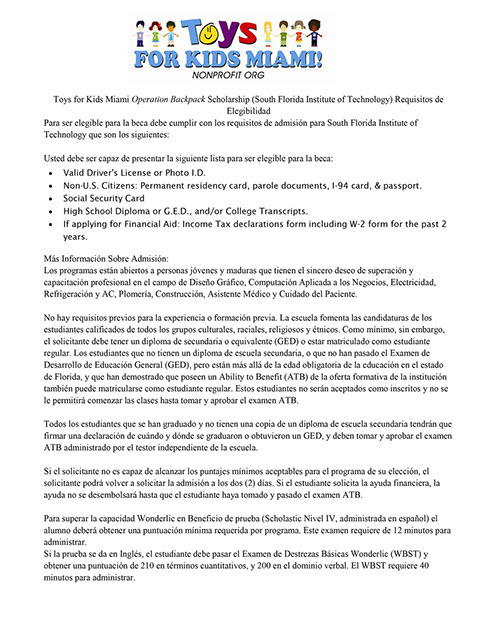 Complete applications are then submitted to Toys for Kids Miami Foundation for consideration. Recognize students for their educational achievements. South Florida Institute of Technology’s number one priority is our students and the quality of education. Proudly donated 5 scholarships to Toys for Kids Miami Foundation. SFIT programs also enhance students’ existing technical skills and expertise in a particular vocational field in order to provide our students with skills for a lifetime of opportunities. To apply for this scholarship please email us or call us for more information.